What a year and season it has been. The Christmas and holidays moved fast, as the wife and I traveled to Fresno CA, Pleasanton, CA, then up to see my grandkids in Tillamook Oregon; seeing old high school buddies along the way. We even saw a few migrating whales on the coast. I returned on the old route 66 map, to make our Thursday meeting last week. It’s good to get grounded again, back home, and happy to be among friends. It was a great meeting, Jerry came through as usual with a feast that most of the “fast food” generation would not appreciate until they tasted it.c Beans with onions, ham, and all the fixings. Cornbread on the side. And then dessert. Wow. Jerry Sebert is a treasure as well as most of the crew. It was great to see Eli and at least fifteen other patriots there. We had to tip our hat and salute one of our favorites that has to move on. It was a mixed celebration of birthday and goodbyes, as Johnny Doudna is moving off to Wyoming. That young man did much for the Post helping make the upgrade for heat and air happen this past year. Salute troop! We will be recognizing a few other youngsters in the coming month. This kid Rex Mantooth keeps hanging around, so I guess we need to celebrate his, as well as Eli Prater’s birthday. All kidding aside where would we be without these guys? They served their country, community, and their God so well. They have lives that stand as models to those of us behind in the ranks. A salute is in order for Chris King who received his Legion “cap” in a brief ceremony surrounded by fellow BB stackers (13 Bravo Artillery). He was in the 172nd Infantry. Salute! There is more to report than I have room for, so I will wind down with this. Pat Passmore donated a 105mm shell from OKANG 45th 1959 from the Ft Chaffee deployment. The casing was dated 1944. It was rumored to serve as an ashtray at one time, but now serves a nobler task, honoring those who served at our humble Post. Our regular meetings are usually the first and third Thursdays at 7:00 PM. However, the next meeting is January 22nd. Monday morning Koffee Klatch meetings in January are still up (if weather permits) and running starting around 0700 till about 0900. Thanks to the crew for providing biscuits and gravy and maybe a waffle or two and always a cup of Joe (coffee to the civilians). If you are a veteran come on by. If you have a good story, it may end up in print! 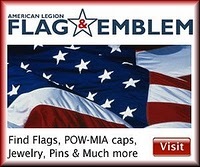 Also keep up with us at website “americanlegion142.org”.